Bokashi — Keep it dry and it won’t smell. Promise. 2 Comments on Bokashi — Keep it dry and it won’t smell. Promise. The trick to enjoying life with your Bokashi bin is to keep it dry in there. Honestly, it’s that simple. Yeah, you have to have an airtight bin and sprinkle on the bran regularly but if it smells in your bin chances are it’s just too wet. The process is probably doing fine but it’s just nicer if you don’t have any smell to worry about. The easiest way is just to avoid putting really wet food in the bin. If you have a bin with a tap a lot of the moisture will find it’s way down to the bottom and you can drain it off. But quite often there’s a condensation process going on in parallel and you find you have moisture gathering up on the top of the bin. A simple trick is just to lay a newspaper in the top of the bin, it will absorb most of the dampness and take the smell with it. But it’s not so silly to drain off as much of the external moisture as possible before you put things in the bin and let the Bokashi juice come on it’s own in due course from the moisture in the food itself. 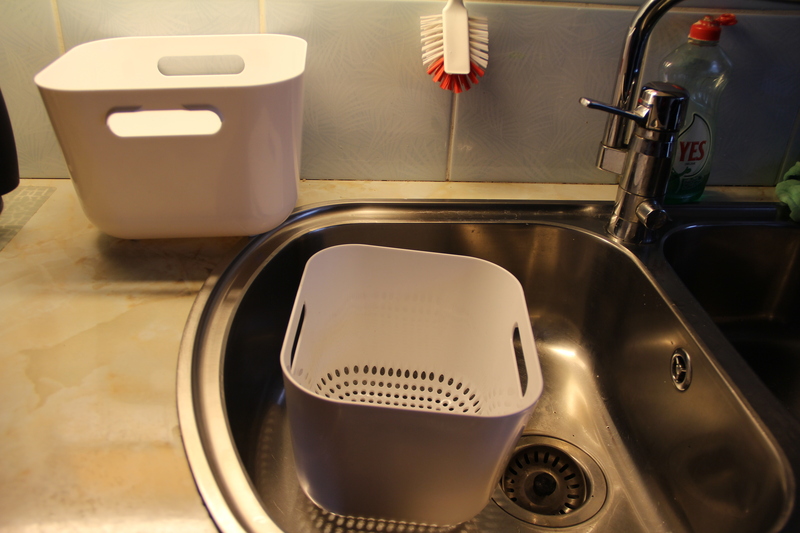 The pictures show a couple of things I picked up from Ikea recently, here in Sweden they were in the kitchen hardware section, by the recycling bins and the place where they sell kitchen sinks and cupboard doors. The black one is brilliant to have over your sink. You can peel your potatoes straight into it and let them run off for a while. 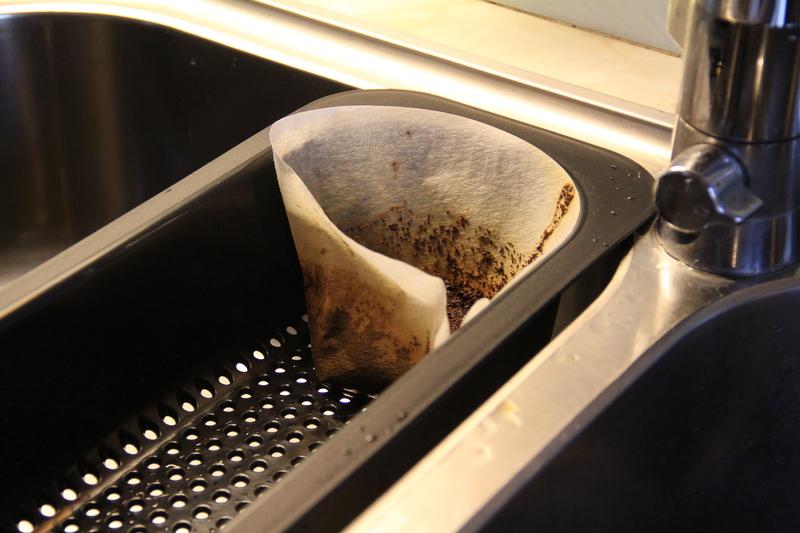 Let your coffee filters and tea bags stand a while before they go in the bin, makes all the difference if they can dry up a bit. The white one is also excellent. The two parts fit inside one another, the upper one has drainage holes and the lower one catches all the runoff. Nice and neat. Obviously you can use any old strainer that you have lying around or invent something out of what you have, it’s not the meaning this should cost a lot of money. But from experience I know you tend to get a bit annoyed with most things which is why I fell for these. A flower pot with a drainage hole and dish isn’t so silly either. Here’s another idea on the coffee front, in all simplicity. We drink a lot of press coffee here (or whatever you call it where you are!). 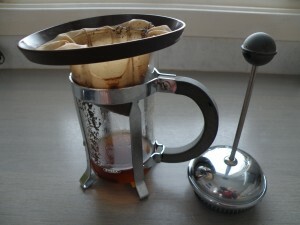 I have a nylon coffee filter handy that I tip the coffee grinds into afterwards. You can just let it run off into the coffee maker or a cup or something. Dries up quite quickly and is easy to deal with. Shrimps are another thing — dry the skins off a bit first and you’ll have no trouble with them in your Bokashi bin. It’s when they’re dripping wet that they cause problems. You could always put in something dryish on top of them in the bin, serviettes for example, bread, rice or whatever you’ve got handy that will help pack them in and dry them up so the Bokashi can do it’s work. Anyhow, that’s my two-cents worth on the subject. Not exactly glamorous writing about how you dry up old coffee grinds and shrimp skins but that’s our reality here in BokashiWorld :-)!! Love to hear your ideas, tips, the simpler the better. The more we can share our tiny daily inventions the easier we’ll make it for more people to get involved and like what they’re doing. So thanks! Another important blog for us trying to keep our Bokashi turning out just right. When that stuff gets smelly, it is a smell quite indescribable. Best to keep it doing it’s non-smelly thing. It doesn’t take much effort to have wonderful garden food on hand always. I have been using your bag Bokashi method nearly since I started a few months ago. As there is no draining off the liquid during the bag process, it is very important to have enough dry stuff in the bag to see it through the ferment cycle. I am only sharing all this because I absolutely love the idea of being able to stock-pile my Bokashi until I need it. If I don’t include lots of dry stuff and bran I will maybe start to dislike my Bokashi – and that is not what I want. Yesterday, Jeff and I used 6 bags in a raised garden. Some I split open and spread around, others I left in their compostible bags (I am hoping this will act like slow acting fertiliser as these will break down long after the opened ones do). I have specially been using small (6L) buckets to create these small bags which fit ok in Permaculture sheet mulch layers. 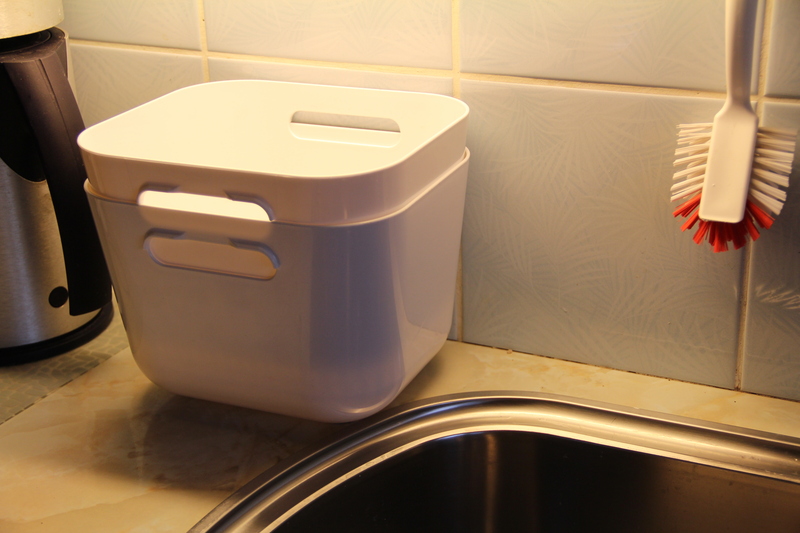 When I have put lots of newspaper, bread, serviettes, paper plates or other absorbent material in the bucket, there is little or no smell when the bag is opened. Among the ones I opened yesterday were my ‘holiday Bokashi” bags which contained cooked and raw prawns, calamari and fish. Not a problem as on holidays we used paper plates, serviettes and had lots of left over bread, etc to soak up the liquid. Thanks for yet another interesting blog post. I’m still having a lot of fun trying different ways to make and use Bokashi. Another helpful post Jenny – thanks. Previous Entry Living soil. Read all about it. Next Entry Bokashi in the greenhouse.